Everyone likes limoncello. For me, just a sip brings back memories of summer and sand and seafood by the shore. The best limoncello exquisitely balances the pungency of lemon zest and the sweetness of sugar, with just an intriguing hint of bitterness. The quality of commercial limoncello can vary wildly. (I know people who compare the taste of bad limoncello to Lemon Pledge, a popular furniture polish here in the US.) 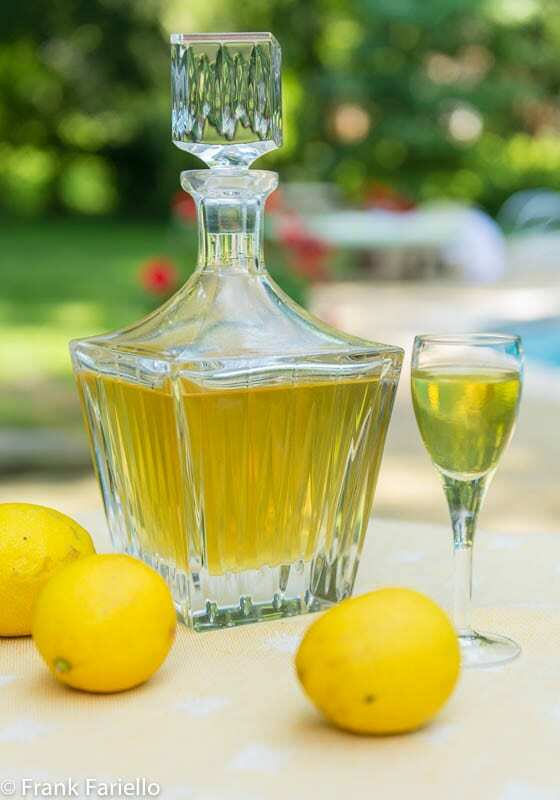 Luckily, limoncello is really very easy to make at home, so you can adjust the recipe to suit your own taste. Limoncello is nothing more than alcohol infused with lemon zest, then mixed with simple sugar syrup. It just takes a bit of patience, as the infusion needs a few days. And while limoncello can be consumed as soon as it’s made, it’s much better is left for at least a week to mellow. This recipe comes for Jeanne Caròla Francesconi, author of the authoritative La Cucina Napoletana and my muse in all things Neapolitan. She says her recipe makes a rather dry limoncello—which she calls limoncino, by the way—and that’s exactly the way I like my limoncello. Peel the zest off the lemons, making sure that you leave as much of the pith (the white layer below the zest) as you can behind. 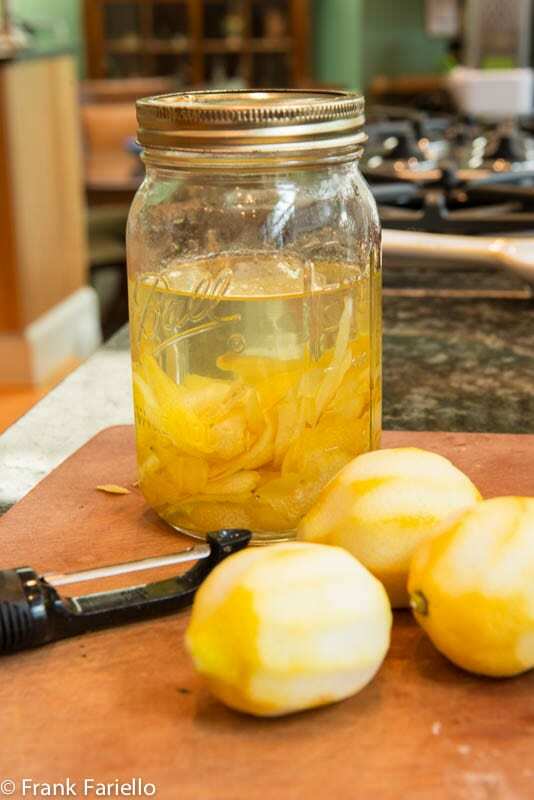 Place the lemon zest in a mason jar in which you will have poured the alcohol. Close tightly and put the jar in a cool, dark place for 3 or 4 days to infuse. Once the infusion is done, heat the sugar and water over a high flame until the sugar has entirely melted and the water is just about to boil. Turn off the heat and let the resulting syrup cool completely. Filter the infused alcohol through a sieve lined with cheesecloth into the syrup. Then pour the mixture into a decanter or bottle. Let your homemade limoncello rest for about a week before using. It is at its best served very cold. As mentioned, the great thing about homemade limoncello is that you can play with this recipe to suit your personal tastes. Adding more lemon zest or letting the alcohol infuse longer will give you a more intensely lemon flavor. Using more or less sugar will adjust the sweetness. And leaving a bit of pith on the zest will lend some bitterness, which I think helps balance out the flavors. Since this recipe uses the peel, it is really good idea to buy organic, even if you don’t normally care about such things. The peel is where any trace pesticides are lurking in non-organic fruits and vegetables. And avoid lemons that are treated with wax to make them shiny—t’s not something that would add a nice flavor to your limoncello. As for the alcohol, I’ve always used inexpensive, unflavored vodka, not caring too much for ‘quality’ in a spirit that is (or should be) perfectly odorless and tasteless. In Italy, grain alcohol is the traditional ingredient. It is preferable because it really is pure and entirely tasteless. Before writing this post, I had been under the impression that grain alcohol was illegal in the US, and it is certainly still hard to find— but, as it turns out, you can now buy a grain alcohol, produced especially for those who want to make spirits at home, called “Everclear“. Apparently, though, grain alcohol is still illegal in about a dozen States, including New York. This recipe for homemade limoncello can be used with any citrus fruit you feel like: oranges are particularly popular, but do try grapefruit or, for a New World take, lime—which you’d call “limecello”, I guess…? Filter the infused alcohol through a sieve lined with cheesecloth into the syrup. Then pour the mixture into a decanter or bottle. Let the mixture rest for about a week before using. The best thing about making homemade “cellos” is that you can tailor it to your personal taste. We like a 24% alcohol final concentration, using Everclear( now legal in NY). I also make other fruit “cellos” that are delicious. Strawberry, black raspberry and peach can be made in 24 hrs because they are so soft. I have to warn people not to overindulge because the fruitiness and sugar masks the taste of alcohol. Also, using Half and Half cream instead of water makes an Italian version of Baileys. Summer in a bottle. So true! And so many options! Last time I checked, Everclear was not legal in my state, alas, so I’m still using vodka. Frank, your limoncello recipe, like all your recipes, works extremely well. Personally, I let the peels sit with the alcohol for at least a week, and then after mixing, I try to let the bottle(s) rest in my wine fridge for at least 2-3 weeks. my problem is dinner guests like it too much. again, thanks! That’s a problem I’m sure you can deal with. 😉 Thanks so much for your comment, Alex! Hi Sue here! I have had a bottle of Amazing Limoncello in my fridge for about a year. Its the last bottle that was given to me by a wonderful Full Italian gentleman. He & his beautiful wife make this in their AMAZING Restaurant. Is this Still good to drink! It is the Very BEST I have ever had! I just made my first batch. I started with Everclear. I’ve added sugar syrup solution but it still is a little too strong for my tastes (doesn’t freeze). It wasn’t quite as lemony as I was hoping. Has anyone done a second extraction by adding more lemon peel to the “finished” limoncello? I think I am at least lucky that I’m around 80 proof right now so that I should still be able to compete an extraction again. I have mine in quart and pint jars now so I can experiment too. Thanks for any advice. after is made am i able to make it cold and and keep it in the freezer without getting frozen??? Angelo, once the Limoncello is made it will keep almost indefinitely in the freezer. Because of the high alcohol content, it will be very cold but will not freeze solid. Just use it straight from the freezer. when limoncello is ready can i freeze it ????? A question: I have made Limoncello, using another recipe that called for leaving the peels in the Vodka for 40 days, and then the same with the sugar syrup, before straining and decanting. Once finished, how long does it last (if not consumed) and what is the best way to store it. I don’t think I’d have the patience to wait 40+40 days, but I bet it does result in a really fine liqueur. I do notice that limoncello just seems to get better with age (up to a point). Limoncello shouldn’t really go bad, but to be honest, I’ve never managed to keep a bottle more than a couple of months… I generally keep my homemade limoncello in the fridge, and my store-bought in the freezer.Just a matter of the kind of container I use—a decanter that’s not freezer-proof. Tanti saluti dal Nicaragua! Il blog ci ha inspirati! Proveremo a fare il limoncello per rinfrescarci in questa eterna estate Nica! Ciao, ragazzi! Tante grazie del commento, fammi sapere se vi riesce bene la ricetta. Vi aspettiamo presto qui a Washington! Yum…freezer cold Limoncello! Besides organic Frank, do you have a preference for the type of lemons you like to use? I do like the idea of the dryness…don’t get that in commercial Limoncello. Here in B.C. you would have to use the Vodka…can’t get the grain alcohol. Aah summer….salute! Of course, Sorrento lemons would be ideal. 😉 But otherwise I haven’t settled on a preferred lemon, although Meyer lemons are particularly nice, of course. As for the grain alcohol, it’s the same story where I live, and that’s fine by me. If you want to freeze the limoncello, do use high-proof vodka. I’m surprised you’ve made no comment in the recipe about strength as ‘ordinary vodka’ is 40 proof while Italian ‘pur alcool’ is 95 proof – which makes a massive difference to the finished article and to your head in the morning! I can just imagine… ! Frank, I am sharing this post with Mio Marito who prides himself in the making of such spirits; The elements and the procedure are quite similar. Your photos took me on a short mental visit to Amalfi. My family originates from the Amalfi Coast where Limoncello is a staple! I love to make it for gifts. Traditionally in the summer it will be kept in the freezer and served icy cold, very refreshing. If this is the plan use grain alcohol or at least 100 proof vodka so it doesn’t freeze in the freezer. Your limoncello looks squisito – and your photos make me wish I were taking a sip — and a dip in that pool. My son has been making limoncello for years so I am spoiled. You’re lucky to have a son like that! Every summer, I announce I making limoncello. Every summer I forget. No excuse now! Sounds easy enough. Start with a real good quality vodka? So this may be the summer to get going for real. For me, the quality of the lemons is crucial, but the vodka, not so much. Since it’s odorless and flavorless—unless you’re talking about flavored vodka, which doesn’t work for limoncello—I’m not really sure the quality of the vodka much matters. Personally, I tend to use the cheap stuff. Well, not the *really* cheap stuff—I use Smirnoff—but I wouldn’t bother with a premium brand, either. But I’m far from being expert in vodkas. I’d be interested to hear what others think.